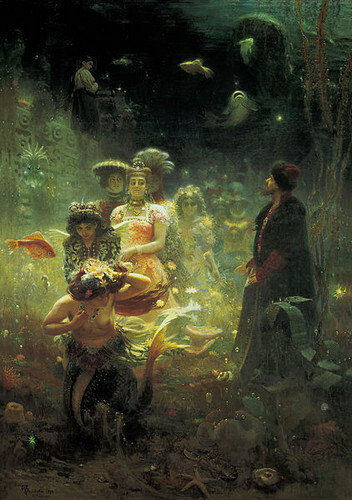 Sadko in The Underwater Kingdom. Ilya Yefimovich Repin, Russian artist, 1876. Wallpaper and background images in the Fine Art club tagged: painting fine art ilya repin repin sadko underwater kingdom. So surreal, and better to study up close in a larger view. I find the murky blue-green mesmerizing. It is a dream in such detail. What a journey!